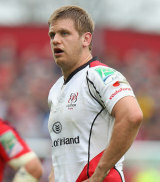 Ulster No.8 Chris Henry has climbed the Irish rugby ranks as the model of consistency for his province. A string of strong performances during the 2009-10 season earned him his first, and so far only, Test cap on Ireland's summer tour of New Zealand and Australia later the same year having done his apprenticeship as part of numerous Ireland 'A' and international training squads. Henry first came to prominence for the Wallace High School, before he represented Ireland at U21 level and got an Ulster Academy contract that was upgraded to a development contract in 2006. He made his debut for the northern province in 2008/9 and at the end of the season he was picked for the successful Churchill Cup squad that won the competition under Declan Kidney. He captained the rebranded Wolfhounds the following season, deputising for injured skipper Rory Best at provincial level as he became a key player at Ravenhill. He was rewarded with a place in Ireland's summer tour squad and won his first cap against Australia. HIs consistent performances for Ulster have kept him in the mind of Ireland coach Declan Kidney but he has yet to win a second international cap.